Neighborhoods of color are disproportionately hurt by abusive and opportunistic appointments of union leadership to powerful positions within the BRA, such as Mike Monahan of IEBW local 103. Having major construction contracts be signatory to unions means only union businesses may bid on work in the coming construction boom in our city, estimated to be worth $4 billion dollars over the next decade or so. That stipulation essentially brings the first two bars in the graph below to very near zero, if not zero. 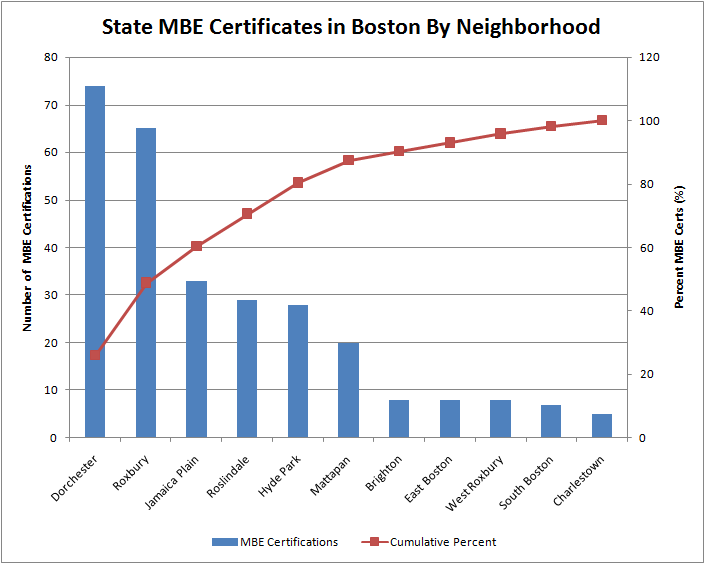 And no work is a devastating blow to businesses of color in Roxbury and Dorchester, communities in our city with the highest concentration of MBE certification. If we’re under any illusion that a calculated appoint like Mr. Monahan doesn’t affect the outcome of construction contracting and elections in this city, think again! These kinds of appointments started under Mayor Menino’s reign and are in part the source to his power to be re-elected, given the political clout many unions wield. Mr. Monahan’s appointment to the BRA board is a clear conflict of interest and abuse of power! And that abuse of power is killing our businesses of color in this city and killing the neighborhoods that depend on their viability for jobs and an economic future! Can Marty Walsh as mayor, given his close union ties, stop this kind of appointment policy, or will it worsen? Given the political power of unions to make or break, can any mayor afford to put an end to this outrage? Will the city council approve this appointment and who on the council will help to confirm the appointment? To those council members that say yes to the confirmation: what are they saying to businesses and communities of color? The construction project at 225 Centre Street in Jackson Square, headed by Mitchell Properties, The Community Builders and Walsh Brothers demonstrates the destructive affect of union only work, supported by the developer, builder and Mayor Menino. 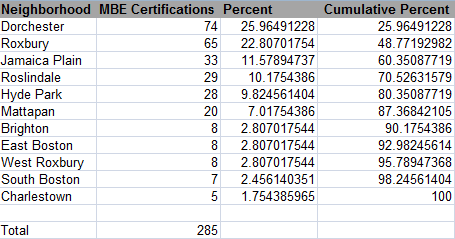 Union only excluded better than 95% of ALL MBEs, to the point where not one MBE firm from the city of Boston is working on a nearly $ 53 million dollar project. Whose community are we building anyway? We have the power to change things. We can elect a mayor that works on our interests, on our behalf and has our back! We can also send a message before the city council vote to confirm Mr. Monahan. Call your at-large and district city councilor and tell them to vote no to Mr. Monahan’s appointment! 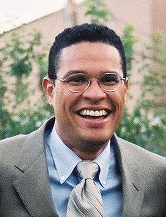 His appointment does not serve the interests of neighborhoods of color in Boston. Source of the data is the SOWMBA database.